We claim to be the best charter in the Southern Maldives. 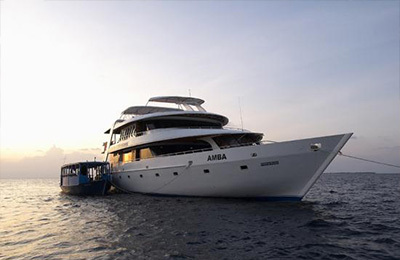 If you are looking for a the best boat in the southern atolls in terms of quality, size and price, you have found it. Great boat, great food, great crew. We have 9 crew that take care of you round the clock, and 1 surf guide who is completely dedicated to you from 5.30am to whatever time you are up. We accept solo and group bookings. Single cabin bookings possible. More than 2/3 guests are returning guests, that speaks for itself. We could accommodate 16 guests, but we limit the number to 12. 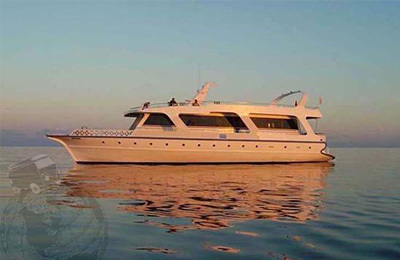 Blue Shark’s maximum capacity is 18 guests with 9 twin cabins with own bathroom. We however limit the capacity to 12 guests to provide maximum space and less people in the water. 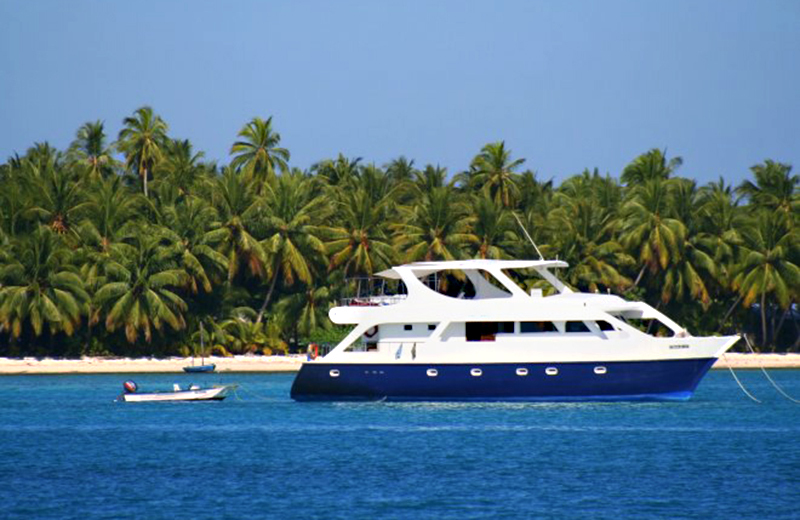 The Blue Shark is a traditional Maldivian safari boat and the perfect boat for surf trips. It has the ideal size, offers plenty of space on board with its several decks, is well equipped and maintained, the professional and friendly crew is always there for you. The Safari boat is equiped with all modern safety equipment, such as sonar depth sounder, CB Radio, GPS, Mobile Phone, Search light, plotting tools kit, Compass, Chart,Standard safety equipment, first aid kit. The safari boat comes with one of the best surf Dhonis of the Maldives, with plenty of space to store your quiver, you material, to watch the surf, and is an excellent fishing boat. The safari boat also comes with a Dhingy for short trips to and from the surf breaks. 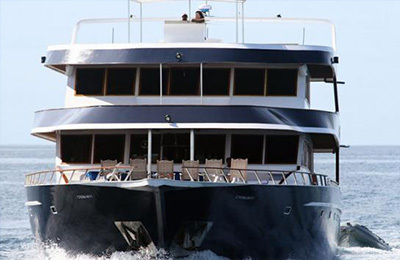 There is no better way to spend so many hours surfing that on a safari boat. And since we are in the Southern Atolls with less crowds, you will also get more waves while you are in the water. And we have been around since 2000, so we know where the best conditions are. Food is really important to us. We love food. So we have two chefs who cook the best food in the world. Our crew spends a lot of time fishing, in order to have some good fresh fish on the table. You are welcome to participate. Either at night, behind the boat, or during daytime with our dhoni. Who knows, you might catch a gigantic sailfish. Nature is so beautiful in the Maldives. We see dolphins every day. There’s the coral, you can snorkel right next to the spots, or we can show you some great snorkling reefs. You want to see an inhabited island? No problem, we’ll show you some exceptional places. On each trip we organise a BBQ on an inhabited island. We have the island just for us, with the stars in the sky. Most of the time we are based in the southern atoll. The geographical name of the atoll is Huvadhoo, which is divided in two political regions, Gaafu Alifu and Gaafu Dhaalu. It is the biggest atoll in the Maldives. It has two airports, one in the north east and one in the west. Depending on our exact location in the atoll, we will direct you to one or the other airport (we can do that for you). There are many options to book your international flight to Male, Maldives. We will provide you with all relevant information about arrival and departure times. Usually we book the domestic flights on behalf of our guests (flights from Male’ to the Huvadhoo atoll). We accept single bookings and group bookings. Full charter prices are based on the price p.p. x 10; maximum 14 pax.